The politics of Brazil take place in a framework of a federal presidential representative democratic republic, whereby the President is both head of state and head of government, and of a multi-­party system. The political and administrative organization of Brazil comprises the federal government, the states, the federal district and the municipalities. The federal government exercises control over the central government and is divided into three independent branches: executive, legislative and judicial. Executive power is exercised by the President, advised by a cabinet. Legislative power is vested upon the National Congress, a two-chamber legislature comprising the Federal Senate and the Chamber of Deputies. Judicial power is exercised by the judiciary, consisting of the Supreme Federal Court, the Superior Court of Justice and other Superior Courts, the National Justice Counciland the Regional Federal Courts. 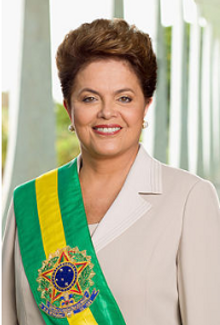 In 2014, Dilma Rousseff was elected for another four years, to be the president of Brazil. Lately, the country has been going through some major economic crisis, and the popularity of the President has fallen a lot. Every month, we can see diferente areas stopping their work for some days, in order to get better salaries and better conditions of working.